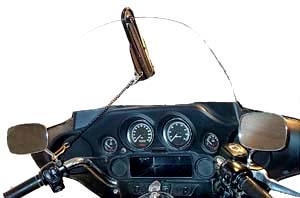 LW-1: The LW-1 Motorcycle Windshield Wiper Blade really helps the rider to see when riding in the rain. 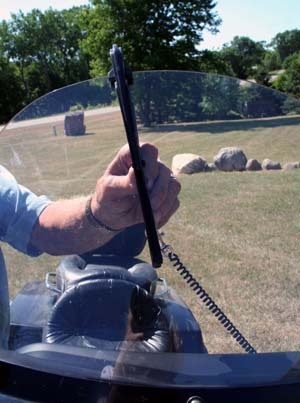 You can wipe both the front and the back of your windshield while sitting with one easy hand motion. The tether cord and safety clip help to keep the LW-1 in place. The safety clip attaches to any convenience cable on your handlebars. The LW-1 is a manual wiper blade designed to work with the left hand by pushing forward to wipe the back and by pulling back to wipe the front of your windshield. When the rain stops, the LW-1 can easily be stowed in your saddlebags or tour-pak. A great safety feature for motorcycles. Special sale item. 1. With your left hand, just slide the wiper onto the windscreen and make a swipe with it whenever needed. 2. 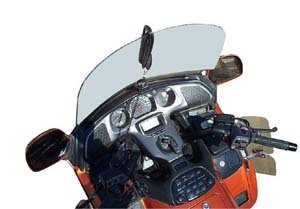 The wipers can stay positioned in the center or at the corner of the windscreen for easy access. 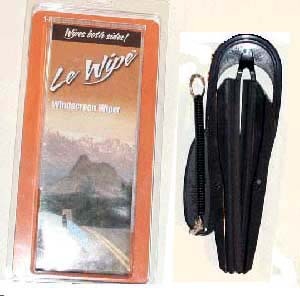 Should Le Wipe come loose from the windscreen, the coiled tether cord and snap swivel prevents loss. 3. To adjust for more or less pressure on the wiper blades, simply bend the U-shaped end piece until the blades are positioned correctly.